LEDGlow offers 3M Adhesion Promoter that creates an extra layer of adhesion between the LED strip and your bike when installing one of LEDGlow's Motorcycle Lighting Kits. LEDGlow offers 3M Adhesion Promoter that creates an extra layer of adhesion between the LED strip and your bike when installing one of LEDGlow's Motorcycle Lighting Kits. This promoter is not required for installation, but gives additional strength to the already included 3M tape. 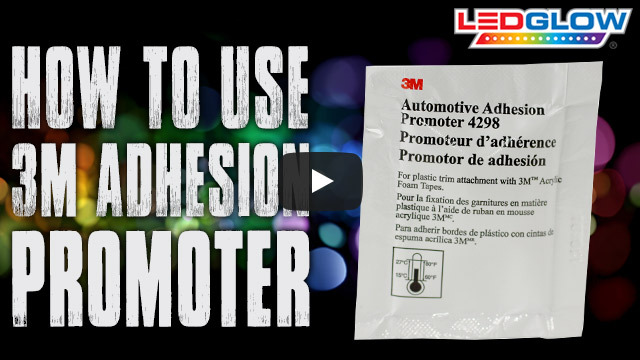 This adhesion promoter is used to improve the adhesion of 3M Attachment Tapes to most plastic materials, as well as injection-molded body side moldings and claddings used for automotive exterior trims. Warning: You MUST read the included 3M Technical Data Sheet before using this product.